Discogs Enhancer is a free, open source extension that adds extra features to both Discogs.com and Chrome. 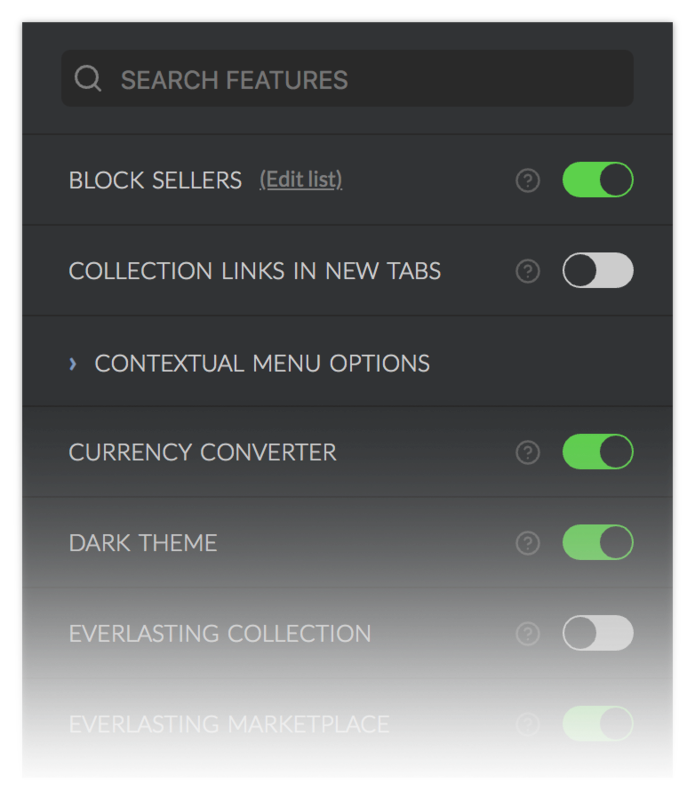 You can block sellers, use a dark theme, see price comparisons, get feedback notifications, convert foreign currencies, search Discogs and other online record shops with any highlighted text, improve tracklist readability, customize lots of Marketplace aspects, and more! Every feature is optional so you can choose only the features you want to use. Search Discogs and other online shops instantly with any highlighted text! Compare the prices that Discogs suggests to the seller's listed price. Give discogs.com a dark look. Great for late night digging. Automatically filter out any listing that's below a specified condition or that ships from any specified country! See total play times for any release that has track time information. Tag any Seller in the Marketplace who's reputation is below a percentage specified by you. Counts the characters for any "notes" field in your Collection so you’ll know when you're near the limit. Get notified when new buyer or seller feedback is left on your profile. Block SellersTag or completely remove any Seller in the Marketplace. Collection links in new tabsOpens all links within your collection page in new tabs. Contextual Menu OptionsSearch Discogs and a number of other record stores with any highlighted text. Everlasting Collection (Beta) Infinite scrolling on the collection page if your account has the old Collection layout (if you have more than 2500 items, you have the old Collection layout). Everlasting Marketplace Scroll forever in the Marketplace! New page results are automatically added to the bottom of the page. Favorite SellersAdds a small icon next to your favorite seller's names in the Marketplace. Feedback NotificationsGet notified when new feedback is left on your Buyer and Seller profile! Filter CountriesShow or hide any items in the Marketplace that ship from any country. Filter Media ConditionHide all releases that fall below a specified media condition in the Marketplace. Filter Sleeve ConditionHide all releases that fall below a specified sleeve condition in the Marketplace. You can also optionally hide "Generic" and/or "No Cover" items. Fix Blurry Gallery ImagesClears up some images on non-HD monitors. Hide Min, Median, & Max ColumnsHide these columns in the Collection page. Improved Collection UIRearrages the UI for a more streamlined approach. Inventory RatingsMarks an item's rating in red if it is above the value set in the option when viewing a seller's inventory. Large B.A.O.I. FieldsMake the Barcode And Other Identifier fields span the width of the form. Large YouTube PlaylistsSee up to six videos in playlists at once. Marketplace HighlightsColorizes the Media and Sleeve conditions. Notes CounterTracks the character count in your collection's Notes fields. Random Item ButtonSee a random item from you collection from any page. Rating PercentageShows the release ratings expressed as a percentage. Release ScannerScans a single page of releases and counts the number of comments on each release of any Artist or Label page. Remove From Wantlist ShortcutsAdds a shortcut link to remove a release from your wantlist directly from the Marketplace when viewing "Items I want". Show Actual DatesSee the actual date and time an item was added to your Collection or Wantlist. Show Average PricesSee the average price paid on each Release page. Sort ButtonsSort Marketplace and Explore filters alphabetically. Suggested PricesCompare item prices to the prices Discogs suggests they sell for. Tag Seller ReputationTag any seller who falls below a specified percentage. Text Format ShortcutsQuickly format text in comment boxes and in the Forums. Tracklist ReadabilityInsert visual dividers between each Side, Disc and Format of a release.